All Premium trains consist of new carriages of the Tver Carriage Works. The ticket prices of Premium trains are usually higher than for other trains but always include meals. 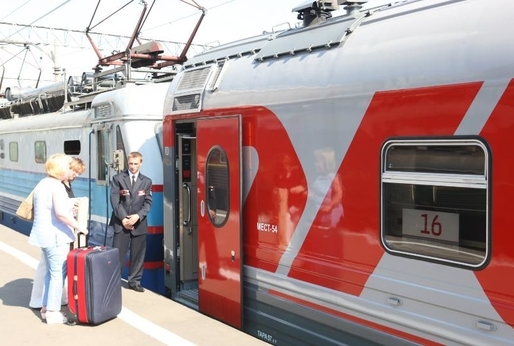 All Premium trains depart from Kazansky train station in Moscow. A standard compartment. 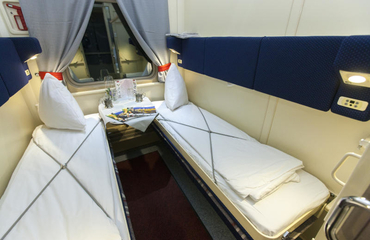 Seats: 2 lower and 2 upper berths 70 cm wide Berths arrangement (number): 2+2 Carriage: 8-10 compartments, a/c. 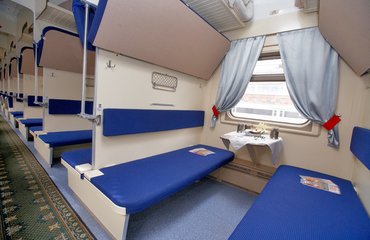 Six Russian branded («firmenny») trains were transferred to “premium” class in 2009. Some of them have their original names, but got the “Premium” status, others use the Premium brand as a name. They run from Moscow to eight Russian cities: Adler (Sochi), Ekaterinburg, Kazan, Novorossiysk, Rostov-on-Don, Nizhny Novgorod. 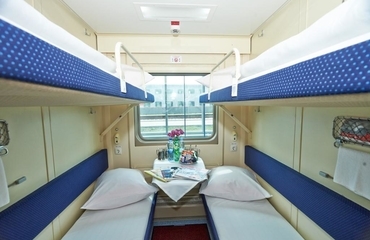 The train consists of modern cars equipped with air conditioning units and bio toilets. A standard train composition includes 17 carriages: a luxury car, 3 first class (SV) cars, 10 second class (coupe) cars, 2 third class (platskart) cars, a restaurant car and a staff car. Compartments are equipped with LCD TVs. The doors of the compartments are closed with magnetic cards. The headrests of the lower shelves are equipped with devices for connecting headphones. In the luxury car there are six double coupes each with a private bathroom (WC and shower).